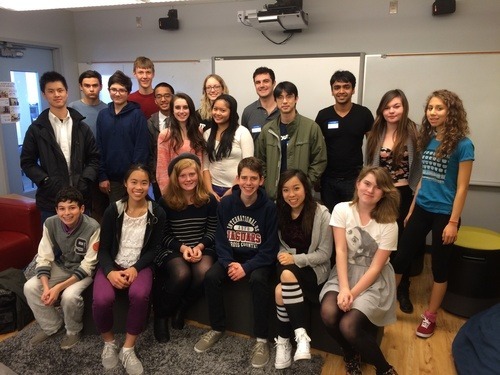 High school students at the French American International School in San Francisco learned the computer program language Python via free course material on Coursera. A few months ago Seth Hubbert, the Director of Academic Technology for French American International School in San Francisco, got in touch with us with an interesting idea. Seth had an idea to form a club of students that would learn Computer Science by taking An Introduction to Interactive Programming in Python from Rice University together. High Schools around the world often find it challenging to offer classes in the most recent computer science fields, despite high interest from students. Seth was creative in overcoming these limitations and preparing his students with cutting-edge skills for when they graduate. Hi Seth, can you please tell us a little more about yourself and the French American International School? What is your background in Computer Science? I’m a former chemistry and physics high school teacher, and now work as the Director of Academic Technology for French American International School. Our school is an independent Pre-K through 12th grade school in San Francisco. We deliver a rigorous bilingual immersion program through middle school, culminating in either the French Baccalaureate or International Baccalaureate program. I don’t have a very extensive background in Computer Science. I took a couple of undergraduate courses while earning a B.S. in Physics, but haven’t touched it much since then. I was learning right along with the students! Tell us a little more about your class/club? How did it work? The club was comprised of 25 high school students interested in gaining exposure to coding. We agreed to sign up and work through the Introduction to Interactive Programming in Python Course. To support one another, we agreed to meet physically twice a week to help each other with the content and stay on track and motivated. I was quite impressed with the dedication of the students! 20 of them (10 male, 10 female) finished the course with high enough marks to earn a Verified Certificate. I was surprised by the number of students that earned their certificate! They are all incredibly busy and have full course loads. I imagined some of them would use this as an opportunity to get a peek at some coding content, without fully committing to the 5-plus hours a week required to stay on top of the work, but I was wrong! They all took the challenge and often gave up their Friday and Saturday nights to fine-tune their projects. I’m extremely proud of their dedication and their skill as programmers! What worked well? What advice would you give to teachers interested in replicating your program at their school? I think having the face-to-face check-in times was key. I think it was beneficial not only for them to get help from each other when needed, but for the social motivation to stick with the course, knowing their peers had made the same commitment. I also was adamant that they not see me as a traditional content-expert teacher. I wanted them to see me as a coach, motivator, mentor, etc., and this helped them rely more on each other for help and support. What’s next for some of your students? What’s next for you and the club? Soon we plan on launching a spring version and bringing a few more interested students into the fold that missed the first opportunity. A majority of students that completed the Python course are interested in going deeper, and continue taking other programming MOOCs to develop their coding skills! Are you a teacher with or without computer science background, but still want to try teaching Computer Science to your students? The always popular An Introduction to Interactive Programming in Python from Rice University is starting next month.